The Dhaka Secondary School aimed at to facilitate the boys and girls residing in Karimabad is imparting them high quality education at reasonable cost in a serene, congenial and peaceful atmosphere. 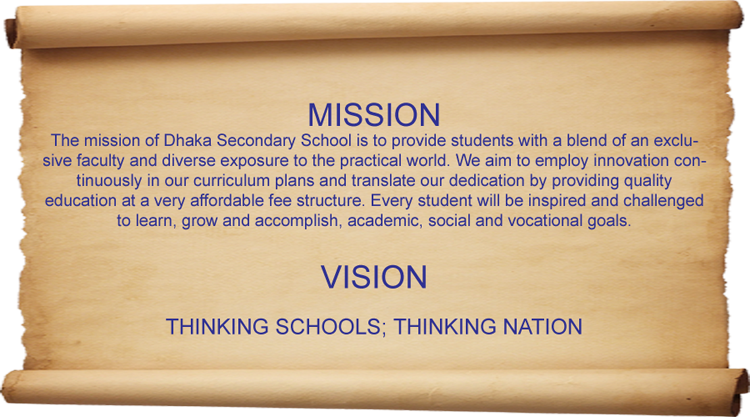 Our aim is not only to educate the children, but also to make them worthy and responsible citizens of the country. So that when they leave our institutions they do not swell the number of educated illiterates but help the society and the country to mobilize its limited resources for the optimum benefits of the nations. *****IMPORTANT***** Please note that the all classes for classes IX and X have been called off. Students will be informed as to when they may collect their admit cards. Congratulations! 100% Result in S.S.C Part - I & II Annual Examinations 2017-18. @DSSK: Admission Open for session 2017-18. Equipped with the best faculty in town, we endeavour to follow our motto 'Quality Education for All'. For any further queries please visit our website dssk.dhakagroup.edu.pk or simply call 36826389, 36826381. @DhakaGroup: It is our greatest pleasure and honour in announcing that Prof. Raees Fatima has joined Dhaka Group of Educational Institutions as Member, Academic Board. Prof. Raees Fatima holds a first class Masters degree in Urdu Literature and brings along with her a life long experience of teaching, feature writing, short story, newspaper columns etc. @DhakaGroup: We would like to take this opportunity to thank Mr. Mir Mohammad Ali Khan (Youngest and First Muslim who have owned and Investment bank at Wall Street) for taking out his time to meet the young and budding stars of Dhaka Secondary School, Karimabad. WE HIGHLY EMPHASIZE on students not getting enrolled in any English language course, computer course in order to cope up with our fast paced academic environment. Address: BS-15/1, F.B. Area, Karimabad, Karachi, Pakistan. Copyright © 2018, Dhaka Group of Educational Institutions. All Rights Reserved.